I had a little rhythm going and then it all got thrown off last week. First, because I was feeling a bit down. And don’t you know: it’s so much harder to do anything when you feel down. On the heels of my little pity party came the ragweed, which had me holed up in bed most of Friday and Saturday until I figured out it was allergies and took a Claritin on Saturday (Sudafed, my standby for colds, had behaved very poorly against my headache and stuffiness). So bullets today? Saturday night, we (TCU) lost our season opener against LSU. 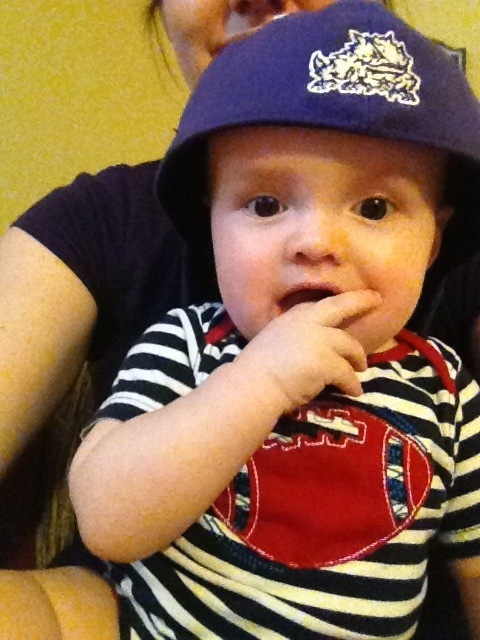 We had a few friends over (including our godson, sporting DH’s TCU hat) and it was fun to be back in the swing of college football. Last season had me lamenting with a “couldn’t we at least have a good football season” post, but Saturday night we looked pretty good despite the loss. I’m cautiously optimistic this season will top last year’s. Well, and I really, really hope it does! We have season tickets this year (so excited) so we’ll be heading to Horned Frog country this weekend for our first home game. Yay! On Sunday and Monday we labored. That’s what you’re supposed to do on Labor Day, right? When we bought our house last year we planned to turn the study into a little library with cabinets and bookshelves to the ceiling to house all of our books. (And we have a LOT of books.) Sunday and Monday, DH’s parents were over to help us hang wallpaper and do some painting and move some electrical outlets (two outlets will be behind cabinets and had to be moved up). We have had the cabinets in boxes in our living room since May, so I’m really excited we’re finally getting started putting things together. 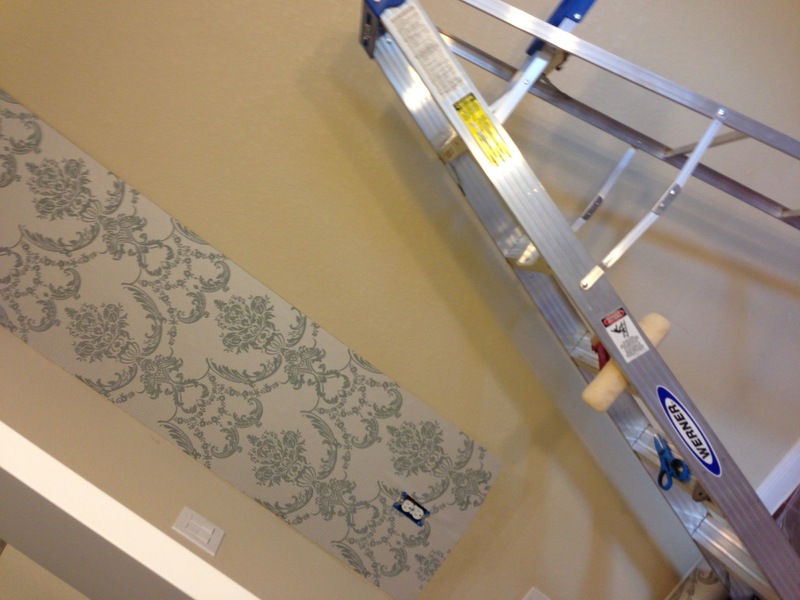 Hanging wallpaper wasn’t as bad as I feared it would be. 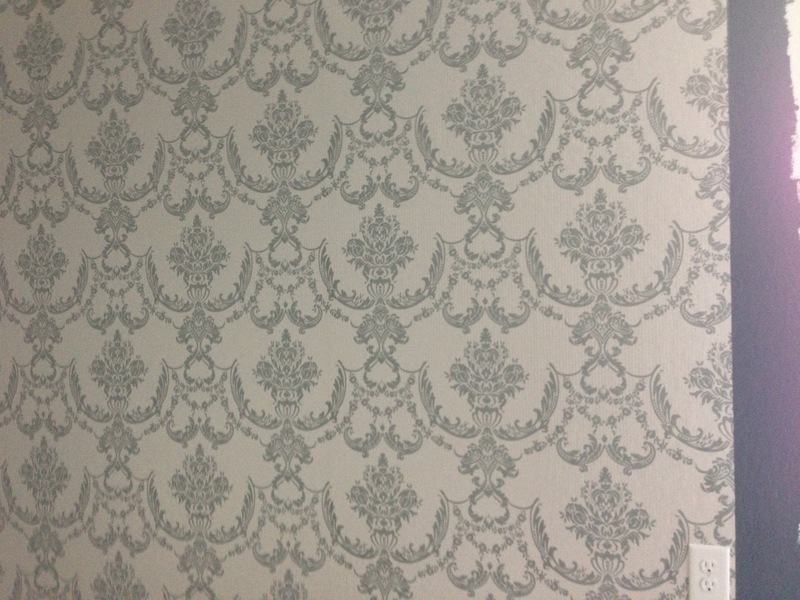 It is going to be the backdrop of the bookshelves. 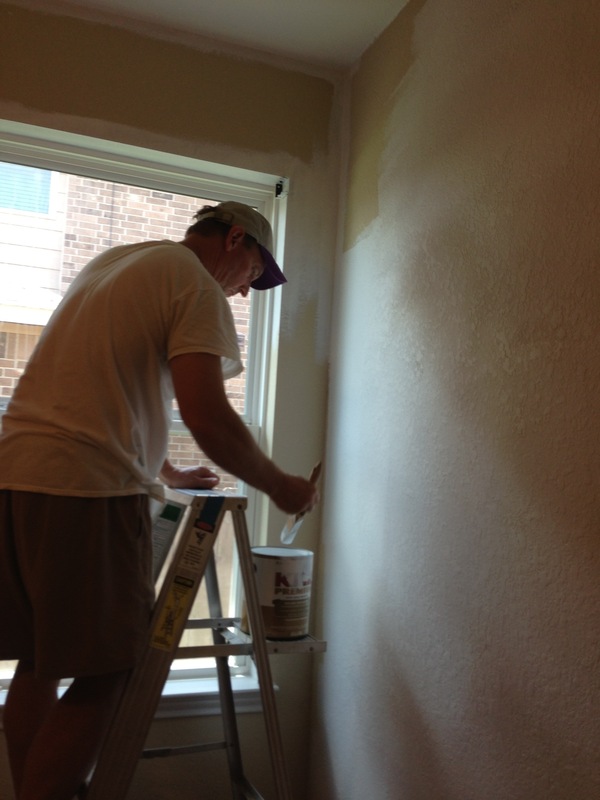 DH and I finished painting the rest of the room last night–a deep, denimy blue. I love it! I’ve inserted a couple of pictures of our progress so far. Can’t wait to get it all finished! Last week I had training to be a core group leader for my Bible study, and tomorrow the ladies will come for the first day. I’m so nervous and slightly overwhelmed and excited… and still a little wiped from the work we did this weekend. Today is my 11th day completely gluten-free. It has not been as challenging as I expected–there’s always gluten-free pizza if I really am craving it. And we found the most delicious gluten-free whole grain tortilla chips on Sunday at our HEB. Yum! The hardest part is when we’re with others … but I did stand firm and turned down pasta salad and brownies the other day at a lunch with ladies in my Bible study (thankfully there were some gf options). Hoping to get into the swing of things and back into my routine soon. I like routines. Categories: Crafting and Other Projects, Healthy Living, Infertility | Tags: allergies, bible study, busy, cbs, college football, community bible study, diy, football, gluten-free, go frogs, home, infertility, labor day, painting, ragweed, TCU, TTC, wallpaper | Permalink.